If you would like to know more, or are are interested in buying, please email me at heshgoldstein@gmail.com or call me at (808) 258-1177. There is a way to obtain the benefits of the bees without making them your pets or endangering yourself. The benefits come from the male seeds of a flower blossom collected by the bees and mixed with the bee’s digestive enzymes and it is affectionately known as bee pollen. It is considered one of nature’s most completely nourishing foods as it contains nearly all nutrients required by humans. What makes bee pollen so incredible is the fact that it is a complete food, rich in protein, vitamins, minerals, beneficial fatty acids, carotenoids and bioflavonoids, which are anti-viral, antibacterial, and helpful in lowering cholesterol, stabilizing and strengthening capillaries. And for you vegetarians and vegans out there, bee pollen is the only plant source that contains vitamin B12. This bee pollen qualifies to be labeled “certified organic” as a recent test found it to be free of pesticides and especially GMOs. When knowing that the sulfur crystals reverse obesity, just about all degenerative diseases, which has been researched and verified by Dr. Stephanie Seneff, a PhD from MIT, the addition of bee pollen to you eating regimen adds to the amazing results that your body benefits from. Bee pollen aids in weight control because it is low in calories and contains natural phenylalanine, which aids as an appetite suppressant and non-GMO lecithin that dissolves and flushes fat from the body. Energy Enhancer – The range of nutrients found within bee pollen makes it a great natural energizer. The carbohydrates, protein and B vitamins can help you keep going all day by enhancing stamina and fighting off fatigue. and common skin irritations like psoriasis or eczema. The amino acids and vitamins protect the skin and aid the regeneration of cells. Respiratory System – Bee pollen contains a high quality of antioxidants that may have an anti- inflammatory effect on the tissues of the lungs, preventing the onset of asthma. Treating Allergies – Bee pollen reduces the presence of histamine greatly improving the allergies. Everything from asthma to allergies to sinus problems were cleared, confirming that bee pollen is wonderfully effective against a wide range of respiratory diseases. Immune System Booster – Bee pollen is good for the intestinal flora and thereby supports the immune system. It has antibiotic-type properties that can help protect the body from contracting viruses. It is also rich in antioxidants that protect the cells from the damaging oxidation of free rdicals. Treats Addictions – Used holistically for healing addictions and inhibiting cravings by suppressing impulses. Because bee pollen crashes cravings, it is a very useful particularly when it comes to weight management. Supports the cardiovascular System – Bee pollen contains very large amounts of Rutin, an antioxidant bioflavonoid that that helps strengthen capillaries, blood vessels, assists with circulatory problems and corrects cholesterol levels. Its potent anti-clotting powers could help prevent heart attack and stroke. Prostate Aid – Men who suffer from benign prostate hyperplasia can find relief by using bee pollen as the bee pollen can help reduce inflammation stopping frequent urges to urinate. Infertility Problems – Bee pollen stimulates and restores ovarian function making it useful to assist in accelerating pregnancy. As well as being a hormone booster it is also a great aphrodisiac. Bee pollen is a food and can be taken in a couple of ways. It can be taken with fruit, which lets it gently perform a little cleansing of the intestinal flora, or you can just put it in your mouth and chew it. Me personally, I eat about one tablespoon full of bee pollen a day as well as two teaspoons of sulfur crystals 12 hours apart. I also put a scoop of Orgain Organic Creamy Chocolate Fudge super food, which can be found online, in my morning smoothie consisting of a banana, frozen organic mangos, frozen organic blueberries, frozen organic cherries, frozen organic strawberries, and vanilla coconut milk. It keeps me full for hours. Also, the fresher and softer the bee pollen the better and this is by far the best I have ever tasted. 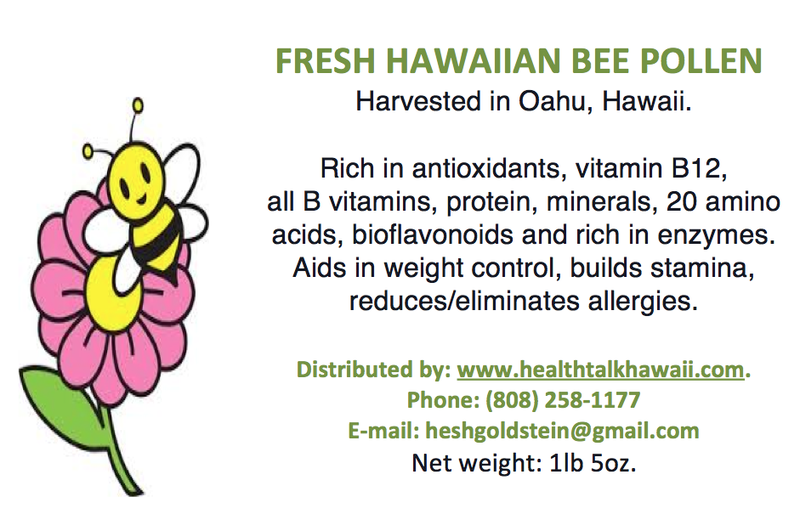 This pollen is produced locally in Honolulu and it melts in your mouth. It comes in a quantity of a bit over 1 pound 5 ounces. The store cost for this would be roughly $50. My cost is $30 or $37 with postage. If you would like to order some please send me an email (heshgoldstein@gmail.com) with your name and mailing address and please put a check in the mail to Hesh Goldstein, 53 McLaren St, Red Bank, NJ 07701. I will send the pollen well before I receive your payment.